Fathers are usually the masculine energy that ground the feminine energy for the couple, allowing mom to open to the baby’s soul. Mother is like a balloon, newly soaring in the heavens and needing father to be her anchor or tether. […] She needs the strength that father’s grounding and stability offers. Without a dad around, a mom must be physically more dense, more masculine and does not open to her spiritual nature as easily, nor allow the baby as deeply into her inner space. Dad has the ideal opportunity and time to develop his protective warrior stance during pregnancy. Not the slaying warrior of the past, but a warrior who protects with his shield of love. 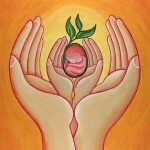 His love surrounds and balances the emotional upheavals that pregnancy can bring.